Whether vaping is safe or not has been subject to fierce debate ever since the first e-cigarettes made it to Europe more than a decade ago. Unfortunately, the debate has reached extremes on both sides over the years. If e-cigarettes and vape kits are ever to reach their full potential as a tobacco replacement, we need to tone down the rhetoric and discuss vaping in real, practical terms. The safety of vaping is a scientific matter. It is not a matter of individual perception, either for or against. Fortunately, the body of evidence in support of vaping as a smoking substitute is growing. The more science studies e-cigs and e-liquids, the more the world is coming to realise that vaping doesn't deserve to be demonised the way smoking has been. This article will delve into safety issues and perceptions later on. First though, an introduction to vaping is necessary for those who are not familiar with the practice. The vaping concept was first developed back in the 1960s by an American engineer who came up with an electric replacement for combustible tobacco. His idea never took off due to the fact that tobacco cigarettes were still quite popular at the time. Fast forward to the early 2000s, when a Chinese pharmacist whose father died of lung cancer decided he no longer wanted to smoke. He set about creating a new electronic device that would still allow him to use nicotine without having to inhale toxic cigarette smoke. This pharmacist, a man named Hon Lik, developed the very first modern e-cigarette device. E-cigarettes do not use tobacco in any way, shape, or form. Instead, they utilise a liquid that includes nicotine suspended in a solution of propylene glycol, vegetable glycerine, or a combination of both. Vapers (people who vape rather than smoke) can even buy e-liquids without any nicotine in them or in different strengths. E-liquid comes in contact with a heating coil known as an atomiser. When electricity is sent through the atomiser, it heats the liquid to a temperature high enough to cause it to vaporise. The process is very similar to heating water in a pan. Once the water reaches a certain temperature, it vaporises and becomes steam. The e-liquid in an e-cigarette does the exact same thing. For the record, this is why the practice of using an e-cigarette is known as vaping. Whether a vaper uses a small vape pen or a large box mod, his or her device vaporises a liquid to create an inhalable vapour. It does not burn tobacco; it does not produce smoke. Now that you know how vaping actually works, let us talk about its relative safety. The word 'relative' is important here because e-cigarettes have never been marketed by responsible manufacturers and distributors as being 100% safe. Even though the technology is now about 15 years old, there is still a lot we don't know about vaping from a physiological and biological standpoint. What we do know for certain is that vaping is magnitudes safer than smoking. In a relative sense, a smoker is a lot better off trading his/her tobacco for e-cigarettes in the long run. In fact, millions of people around the world have already done so. The question is, how can we be sure of the relative safety of vaping? Our first tool is common sense. Depending on who you ask, cigarette smoke contains anywhere between 4,000 and 7,000 toxic chemicals and up to 70 carcinogens. Furthermore, the volume of chemicals in cigarette smoke is rather high. By comparison, both the number and volume of dangerous chemicals in e-cigarette vapour is rather low. Common sense dictates that if you are not inhaling as high a volume of dangerous chemicals, you are not risking harm to the same extent. Think of it in terms of standing around a campfire versus trying to put out a chemical fire without wearing a gas mask. Which do you think is safer? The answer should be obvious. Beyond common sense is scientific study. Over the last 10 years, researchers from all over the world have looked closely at e-cigarette vapour and the potential harm it might cause. Most studies agree that vaping is many times safer than cigarette smoke. And in cases where studies have shown inherent dangers, the risks are almost always associated with malfunctioning e-cigarette devices, low-quality liquids, or users misusing their e-cigs. Despite common sense and a growing body of evidence in support of vaping safety, there are still those convinced that it is as unsafe as smoking. While such perceptions are incorrect, they are understandable. Most of us have grown up with the knowledge that smoking kills people. Anything associated with smoking is, therefore, automatically suspect. Negative perceptions of vaping safety come primarily from two influences. First is the visual influence. Simply put, vaping looks a lot like smoking to the untrained eye. It is hard for people to separate e-cigarette vapour from tobacco smoke because they look so much alike. Therefore, the assumption is that vaping is just as dangerous. This visual influence is primarily the result of ignorance. People just do not know how e-cigarettes work. Their lack of knowledge, combined with what they perceive visually, leads them to believe that vaping is unsafe. The other influence is that of the mainstream media. An unfortunate truth is that modern media is a business. And like any other business, the goal is to make money. Major media outlets make money by attracting an audience. And one of the best ways to attract an audience is with sensational stories and headlines. Mainstream media outlets do a very good job of reporting on all the negatives they believe are associated with vaping and e-cigarettes. They don't give the positive aspects of vaping as much attention. They know readers would rather read stories that fill them with fear than stories that speak of the success of vaping in helping smokers quit, the idea of the media creating a moral panic is not new. Of course, the politics of smoking cannot be ignored either. The various players who intend on keeping the tobacco and pharmaceutical industries profiting from smoking – do not want vaping to replace it. They do their best to influence public perception by focusing only on the negatives.You probably won’t read the newspaper one morning and witness a well established tobacco company express how harmful their products really are. The BBC is one of only a few major media outlets that report on vaping fairly. They do their best to report stories on both sides of the debate, leaving it to their audience to decide for themselves. In an article published in August 2018, BBC health editor Hugh Pym discussed a new report from the Commons science and technology committee about the relative safety of vaping. The article presented both points of view along with quotes from various people – both vapers and non-vapers alike. A conclusion they did come to was that around 470,000 smokers are using e-cigarettes as an aid to help them give up the habit and tens of thousands are successfully quitting each year. Although this may not directly comment on the safety of vaping, it highlights the advantages e-cigarettes can have on a person’s health when successfully quit smoking. The NHS appears to finally be on board with vaping as a smoking replacement after fighting against it for so long. In February 2017, the NHS published the results of the landmark study on its website. That study stated unequivocally that "vaping has been endorsed by health experts after the first long-term study of its effects in ex-smokers." "Their conclusion on e-cigarette safety also finds that based on the available evidence, e-cigarettes are likely to be far less harmful than combustible tobacco cigarettes." "Studies show that levels of key harmful chemicals are lower in people who switch from tobacco to e-cigarettes. There are still some questions about long-term safety…but the evidence is pointing towards them being far less harmful than tobacco." It comes as no surprise to many but an extremely high percentage of UK residents smoke traditional tobacco cigarettes. In 2015, The Office for National Statistics (ONS) reported that 19.3% of adult males smoke, while 15.3% of adult females smoke therefore it is clear relatively more males than females smoke. Although this may be a bit dated perhaps, in 2017 ONS stated that only 17% of adult males smoke and only 13.3% of adult females smoke – again, we are still seeing relatively more men smoking than women, however the data clearly shows that there has been a slight drop in percentage with regards to male and female smokers in the UK. 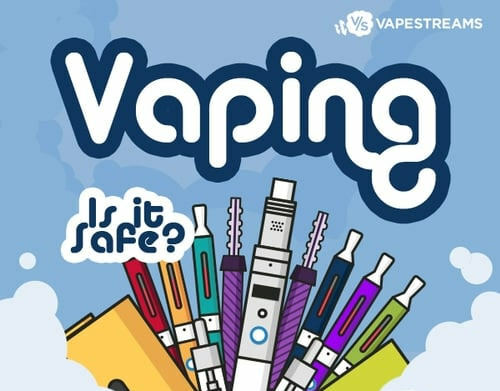 At Vapestreams, we conducted a Google survey where we asked 508 respondents the question, “Do you think vaping is safe”. We wanted to target not only smokers and vapers but non-smokers as we try to evaluate the overall stigma attached to the idea of vaping. Our findings were the following, 44% feel vaping is not safe, while 18% feel vaping is safe. The other 38% of respondents feel they don’t know enough about it to make a judgement about the safety. Our last point is noteworthy as we are now lead to believe that perhaps a large percentage of smokers (and non-smokers) are not educated enough on the advantages of vaporises and information regarding nicotine replacement therapy. The idea that 35% of respondents don’t know enough about vaping may suggest that there are many traditional smokers in the UK that are either not aware of the products and devices available to them or have not been educated properly on the subject. It is clear from the evidence that vaping is exponentially safer than smoking. Vaping allows current and former smokers to continue using nicotine without inhaling the high volumes of toxic chemicals associated with burning tobacco. Thankfully, a growing body of evidence is offering clear answers that should eventually put the debate over vaping safety to rest. Additionally, when it comes to the safety of the actual e-cigarette devices, e-liquids and nicotine shots it is crucial you buy from only registered and official companies – all products and devices go through manufacturing safety checks and many often come with holographic authenticity marks.